Only days after any emergency you’ll see parents looking to get their kids back to school. Dean Brooks, a leading expert in the field, says that schools create a sense of normalcy and physical protection. Disasters like the earthquake in Nepal, the Syrian war, or continuous crises in the Central African Republic and South Sudan have forced millions of people to leave their homes. As a result of their uprooted lives, 63 million children in conflict affected areas are out of school. Some interrupt their education for shorter periods of time, other might drop out completely. Dean Brooks is one of the leading experts on education in emergencies. 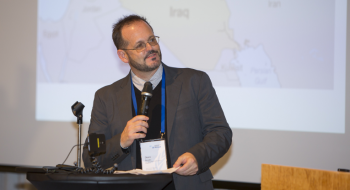 He is the Director of Inter-Agency Network for Education in Emergencies (INEE), and was taking part in UNU-WIDER’s conference Responding to Crises in Helsinki in September. In this interview he explains why education matters in emergencies. What does it mean for a child or young person to be out of school? What are the three biggest challenges with education in emergencies right now? In your opinion, what should be done to solve the situation? “The most important thing is to increase the capacity of humanitarian field workers, ministries and teachers in order to meet the minimum standards of education in emergencies. This lays a foundation for the work. Within this area, I see a huge potential in the Finnish education system. The world wants to learn about the principles to deliver quality education. The emphasis on teachers as a catalyst to quality and change is the key. After that discussions should commence on what is needed in another context. INEE’s Dean Brooks chaired FCA’s panel discussion “Access to quality education in responding to crises” at UNU-WIDER’s Conference in Helsinki in September. Photo: Alexander Zach/UNU-WIDER. Some might wonder whether education really is urgent in an emergency, right after water, food and shelter. Is it really a priority to disaster affected people? But is it just about learning? What are the safety aspects of education in an emergency? “There are so many aspects. A teacher can simply show understanding and talk in a friendly voice. Going to school gives children and youth a sense of normalcy. It’s something tangible you can do for yourself and gain some control of your own situation. It’s also about physical protection; the children are in a safe location and supervised. Protection through education can also entail the delivery of life saving information about land mines or instructions on how to avoid cholera. With the school’s health services there’s also a link to health issues. Currently, only two per cent of all humanitarian assistance, approximately USD 8,5 billion, goes to education. Do you think there’ll be an increase in funding now as the attention to education in emergencies increases? How much more funding is needed? What does it mean for societies and communities – both those left behind and those who host – that 63 million children in conflict areas are out of school? Dean Brooks has over two decades of international education experience working in complex emergencies, conflict, disaster and development contexts. Initially, he worked as an international educator (primary, middle-school and special education). For the past 15 years he has focused his work on Education in Emergencies (EiE) and child protection in a number settings including East and West Africa, Eastern Europe, Central Asia, and the Middle East. Most recently, he worked as a Special Advisor on Education for the Norwegian Refugee Council. Read more about Finn Church Aid’s education work. "My question is always that if a child misses a year or two in school, is he or she likely to go back? How many days out of school does it take before you won’t go back? The human capacity to persevere is great, but for every day that passes out of school, there’s less of a chance of going back."